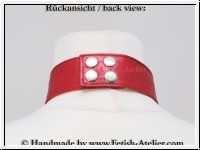 Precious decorated neck band with a width of 3,5 cm (appr. 1,4"). 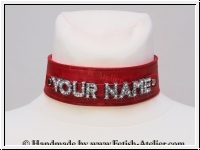 With personalized rhinestone letters. Please send us after purchase your desired name. The rhinestone letters are very sparkling. This Product was added to our catalogue on Sunday, 06. March 2016.